The Newton Public Schools has implemented an emergency text messaging system. In the event of an emergency, NPS will alert you via text on your cell phone. Please note that this system will ONLY be used for emergencies, including weather-related school closings or delays. It will not be used to share information about regular school events or operations. To receive emergency text messages, you MUST opt-in to receive text messages. You can do this by logging into Aspen and selecting “yes” in the drop-down box below your cell phone number in the contact information section. Help New Schools Foundation Meet its Goal! NSF needs your help for Newton to continue to be one of the best public school systems in the Commonwealth and the nation. NSF is two-thirds of the way to their Annual Appeal goal of $60,000. Please donate today to help them reach their goal. Calculus Project—helping African-American, Hispanic and low-income students pursue higher-level math in middle school through high school. APUSH Program—enabling minority and low-income students to succeed in AP U.S History. DaVinci Program—a continuing the new project-based collaborative approach to learning encompassing science, technology, engineering, art and mathematics. NSF-supported initiatives also address elementary school writing and music; computer coding in the middle schools; social/emotional wellbeing; global education and more. The programs NSF funds span Newton’s diverse student population and impact all of Newton’s 12,000+ students. When you give to Newton Schools Foundation you are ensuring that the Newton Public Schools continue to provide Newton students with the best education in this ever-changing teaching and learning environment. 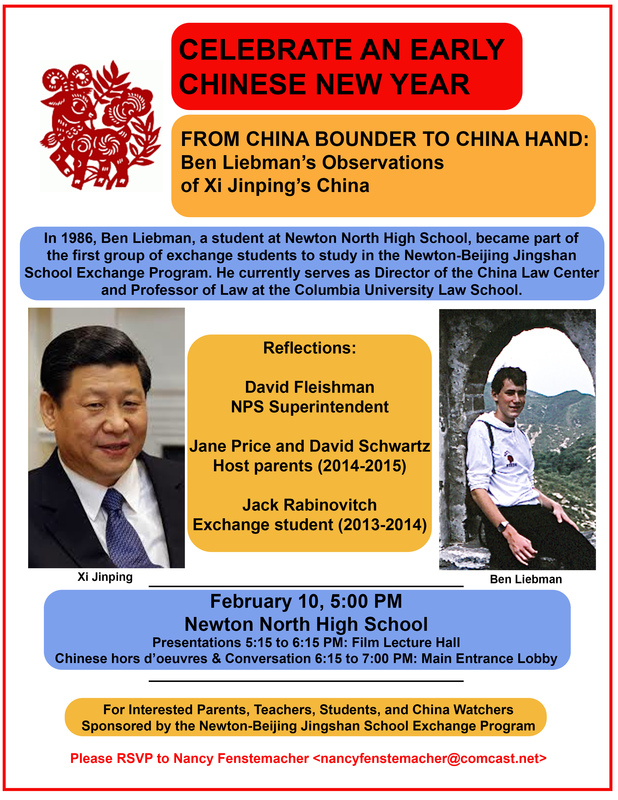 The Jingshan Exchange celebrates Chinese New Year on Tuesday, February 10, from 5 to 7PM at Newton North High School. This is an excellent opportunity to learn more about Newton’s historic exchange program and the opportunities it brings (while eating delicious Chinese food!). Admission is free. The keynote speaker will be Ben Liebman, a Jingshan exchange alumnus and current Director of the China Law Center at Columbia University Law School. Visit here for more information, and RSVP to Nancy Fenstemacher at nancyfenstemacher@comcast.net. Thank you to everyone who came to the Mayor’s & Superintendent’s Reception for the Jingshan students on Wednesday, November 19. Mayor Warren and Superintendent Fleishman were so impressed by the accomplishments of our students and left with a strong sense of the significance of the program. Please consider supporting this valuable exchange by making a tax-deductible donation to The Newton-Beijing Jingshan Exchange Program. Checks may be sent to: Newton South High School, ATTN Samantha Mandel, 140 Brandeis Road, Newton, MA 02459. Thanks very much, and best wishes to all for the holiday season! Please Donate to Newton Schools Foundation, and Help Newton Public Schools Go from Good to Great! For 50 years Newton Schools Foundation has supported the Newton Public Schools by providing private funding for innovative and challenging programs district-wide. 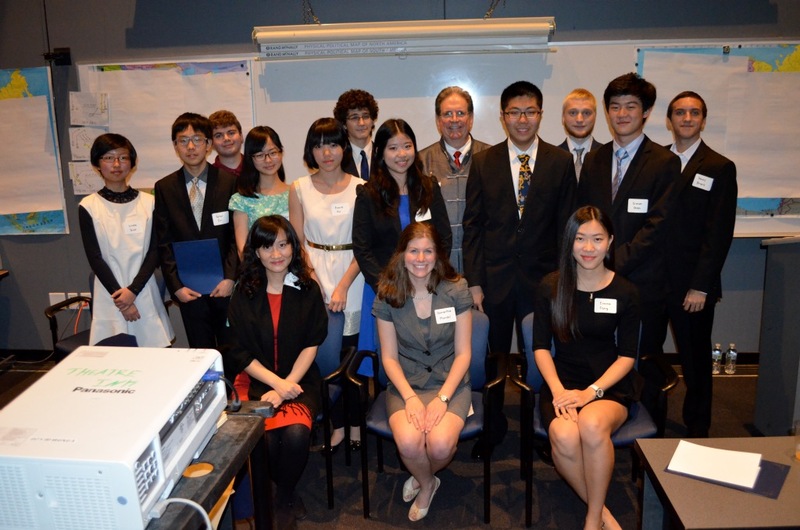 This year NSF is making a difference for Newton students through its Investing In Innovation fundraising campaign. Funds raised through the campaign are helping to ensure that NPS maintains and continues to provide pioneering programs for students and offers faculty and staff first-rate professional learning opportunities. Without these funds, NPS would be unable to expand many offerings district-wide or include students at all grade levels. Newton Community Education is offering affordable SAT Prep Classes to help your child prepare for college admissions. Our classes are taught by familiar instructors who are specialists in their fields. SAT I Verbal Review class: 4 Mondays, 7-9pm, September 29-October 27 at Newton NORTH. Instructor: Alan Reinstein, NSHS English Dept. SAT I Math Review class: 4 Thursdays, 7-9pm, October 9-30 at Newton SOUTH. Instructor: Divya Balakrishnan, NSHS Math Dept. Each course costs $185. For more information visit newtoncommunityed.org or call us at 617-559-6999. Newton Driving School is contracted with the Newton Public Schools through Newton Community Education to offer Driver’s Education to students seeking to obtain their Certificate of Driver Education. The Driver’s Education program consists of 30 hours of classroom instruction, 12 hours of on-the-road instruction, six hours of observation hours, and a two-hour driver safety course for parents/guardians of the student driver. Any student who has reached the age of 15 years, nine months is elibible to begin taking classes. Several different driver’s ed classes are available this fall with classes beginning in October, November and December. For the class schedule see here or visit newtoncommunityed.org. You can also call us at 617-559-6999 for more information or to sign up. Are you someone who believes that all children have the right to be “Safe, Strong and Free?” If so, then join our dynamic team of trained volunteers in the Newton Public Schools’ Child Assault Prevention (CAP) Program, who are committed to teaching children in the Newton Elementary Schools the skills that they need to stand up for themselves if faced with a situation involving verbal, physical or sexual assault. We are now accepting applications for the 2014-2015 school year. The next training begins the week of October 18. 19 Continuing Education Credits available for MSWs. For more information or an application, please visit our website or email Gail Sommer at gsommer@ncscweb.org. Late registration for PSAT will take place on Monday, September 15, and Thursday, September 19, during J Block only. Bring a check (made out to Newton South with PSAT and student name on the memo line), or $30 cash, to Room 1125, (Goldrick, across from the preschool). Do NOT leave a check in Jennifer Dolan’s mailbox or interrupt her classes. You will not be considered registered.